Dar Si Hmad for Development, Education and Culture: Her name is Fatima. She is a singer. And he is "one of us"
Her name is Fatima. She is a singer. And he is "one of us"
More than a year ago, a former member of Dar Si Hmad’s staff posted a piece on this blog about a La’abat performance group we hosted at a public event. Today, we reflect on her thoughts from that evening and the role of music and culture in preventing violence against women and changing society. Dar Si Hmad’s full name is “Dar Si Hmad for Development, Culture and Education”. As an organization, we strive to promote traditional and emerging cultures in southwest Morocco, sharing local customs through positive cross-cultural exchange. Fatima’s La’abat group demonstrates why culture is so closely tied to development, livelihoods, and sustainability for us. La’abat refers to a group of more than three women invited to weddings and ceremonies to dance and sing, performing traditional songs during the special event. 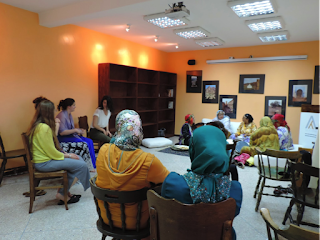 Fatima’s La’abat group came to Dar Si Hmad to share their art with American students from Quinnipiac University while the group was here with our Ethnographic Field School. As part of the Ethnographic Field School, Dar Si Hmad exposes students to local culture, arts, and tradition. Performance can be a powerful ‘contact zone’ where more than one culture meet. Fatima Matousse, the Dar Si Hmad staff member who invited Fatima’s La’abat group, knew what to expect. She had grown up attending similar performances, and she fully expected the students to have a powerful evening of learning. What she perhaps did not expect was to have a powerful evening of insight herself – not about local Moroccan customs, but rather about the unique gendered dynamics that arts and culture make possible. "On the evening of the event, Fatima arrived, accompanied by five women and a male, their driver, who sat patiently in the room as they performed. I did not appreciate his presence and thought of him as an outsider, a distant figure in these women’s world. The women began to apply their make-up and get ready for the show. Fatima asked me to close the door and I asked every male in the room to leave, including the strange man that accompanied the group. Fatima told me, and I could hear the voices of the other women in the background, that he is allowed to stay, that he is 'one of us.' What a strange surprise. It was then when I began to change my preconceptions of the man. "The women did not wait for us to sit down for the performance; it did not seem they needed an audience to mark the start of their instruments and voices. Though we, the audience, were scattered throughout the room, the moment the women began to play, their magic-like music charmed us all. Their unique Amazigh (Berber) music filled the air with positive, healing energy. I watched everyone in the room dancing with joy. "The American students danced to these Berber rhythms. The students were interested to learn more about their history as a group and the meanings of their songs. After the performance, Fatima, her group and our students engaged in a cross-cultural encounter where each was curious to learn about the other. The women felt they could not communicate because they could not understand or converse in English and forgot that the American students also could not converse in Berber. They were equal and agreeable on this, so they announced that their communication is best through music." Beyond the importance of the cross-cultural exchange that happened that evening, the La’abat group’s visit to Dar Si Hmad drove home a reality: that performance space proffers a place for standard gendered roles to be questioned, critiqued, and challenged. "Since childhood, I have been attending La'abat music performances and I speak honestly when I say that they are pure and genuine stars. They have always charmed me with their pride, special charisma and unending courage. They joke and the presence of males does not bother them, an unusual behavior for females within a male domain: the public space. Female performers in Morocco cross the lines of gendered space. Their speech and laughter trespass the boundary that their patriarchal society has imprisoned them in." The music of La’abat, and the women who create it, opens our ears and minds to new ways of thinking. The relationships formed through performance, between singer and audience member, driver and performer, Berber and American, male and female, are unique. As we learned from Souad’s profile earlier in this #16Days Campaign, too often media representations of cultural reflect and reproduce sexist inequalities and promote violence against women. And too often, men are seen as enemies rather than allies in our work against gender-based violence. But as Fatima’s La’abat group demonstrates, cultural expressions can also play a crucial role in pushing against those assumptions, and men can be partners. Music, art, and dance are powerful avenues of expression that we can leverage to change society for the better. And it will take all of us, men and women alike, to make that change happen. It is these realities that inspire Dar Si Hmad’s work in promoting and sharing local culture with people from all walks of life.